Well, I did it. 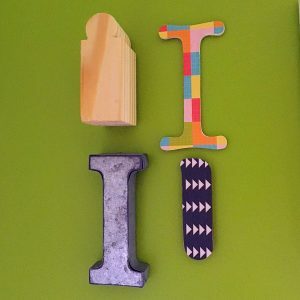 I transitioned my babies from their nursery to their big kid room. It wasn’t without tears…mine. 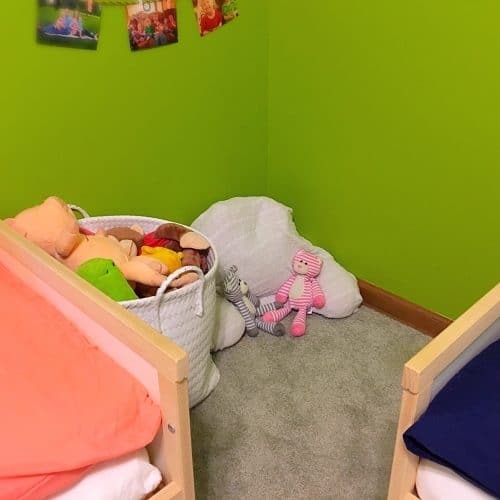 But now I look into their room and see a great place for them to play and relax and grow. 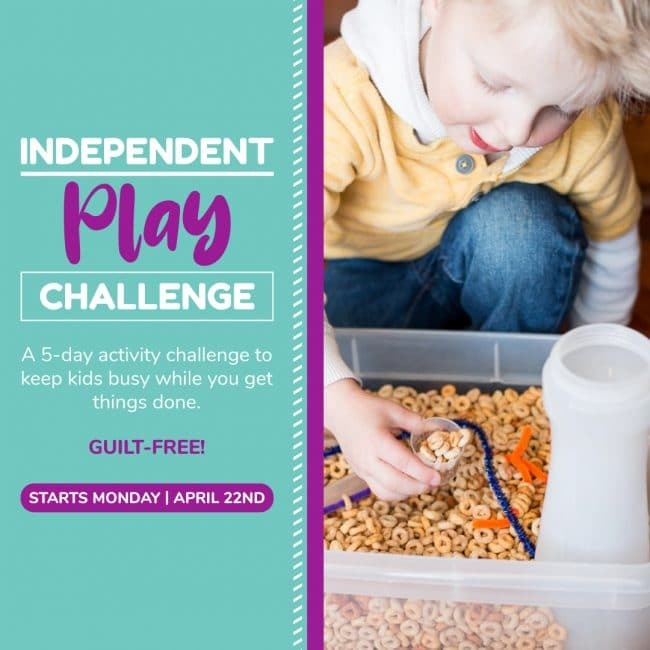 For those that don’t know; I have a girl, who’s almost 4, and a boy, who’s almost 3. They share a room. 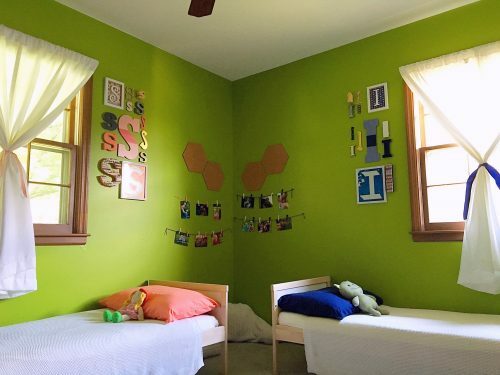 Previously, it was just a neutral room with green walls and decor that worked for both a boy and a girl. But now they have personalities and interests. So I wanted to give them a room that reflected that. Welcome to the brother and sister shared bedroom. Disclosure: Some of the links in the post above are “affiliate links.” This means if you click on the link and purchase the item, we will receive an affiliate commission. Thank you for supporting Twitchetts! The Dressers. Previously, they shared an old dresser that belonged to my great grandmother. The history is fun, but the practicality of it was wrong. They couldn’t open the drawers, the drawers squeaked obnoxiously loud, and it was too tall for them to get into the top drawer. We purchased a couple of small dressers from Ikea. 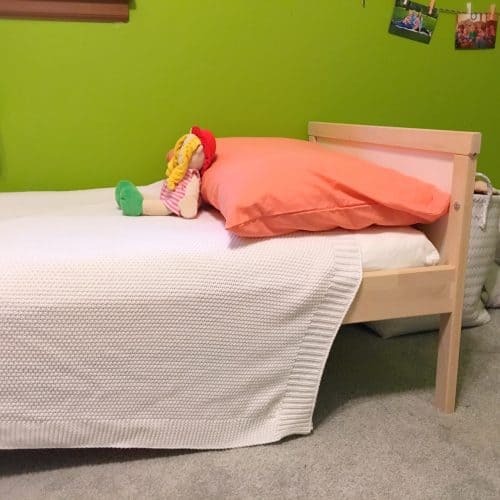 They are inexpensive and not the top of the Ikea quality line, but they will get us through this phase of their lives without taking up valuable real estate. I plan on replacing all of the knobs, but for now, they work just fine. The Hexagons. 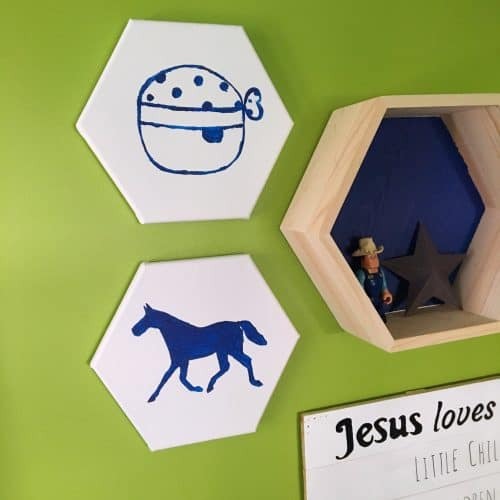 I found these amazing Hexagon shadow boxes in the craft section of Target. I gave them a quick coat of acrylic paint along the back panel. 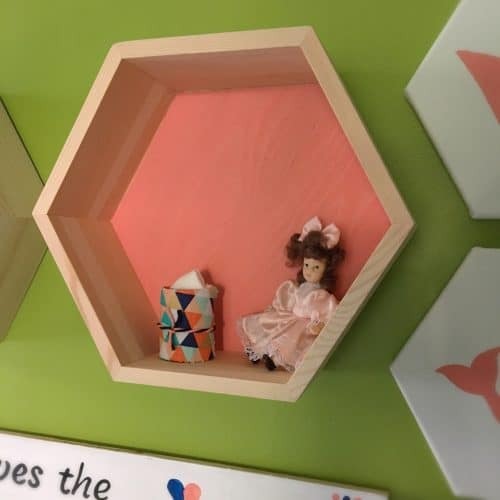 I gave Little Miss a small doll and updated their air freshener with fabric that matched the room. 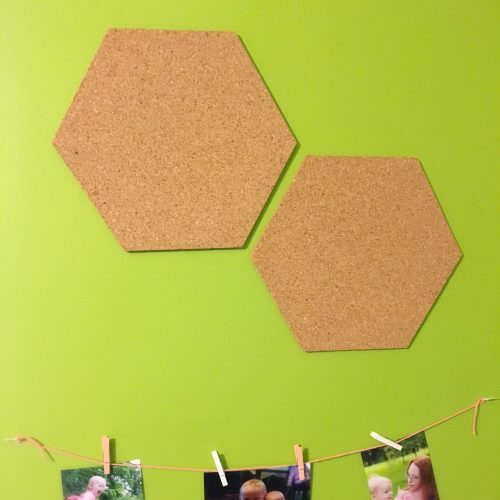 To match, I grabbed 2 packs of Hexagon canvases. I cut out shapes that matched their interests and traced them onto the canvas. Then I just filled in the shape with acrylic paint. Quote Sign. I used some tips from my last quote sign to create this one. I did learn a couple of new tricks, which I’ll share soon. Initial Collages. 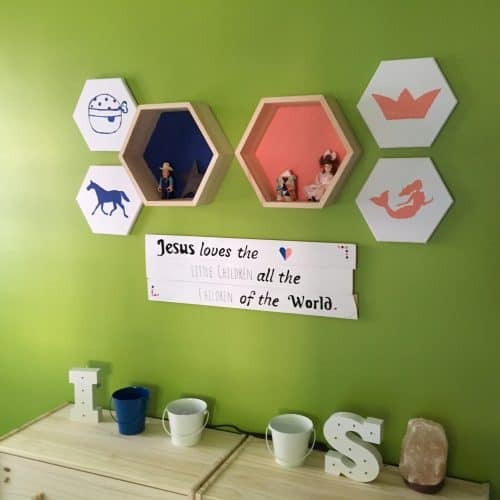 I added some color over their beds with these Initial wall collages. 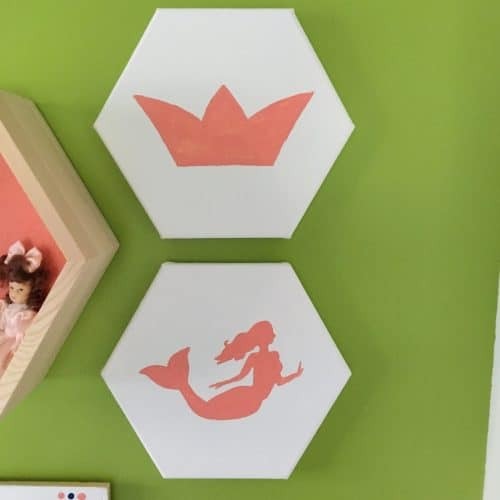 I used the coral colors as the base for Little Miss’ wall. 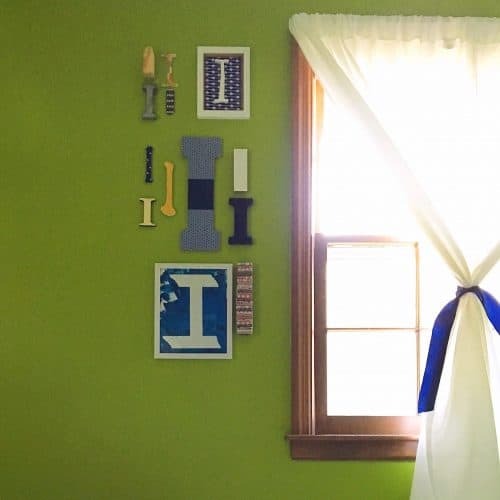 Then I used the Navy Blue for Mr. Monster’s wall. 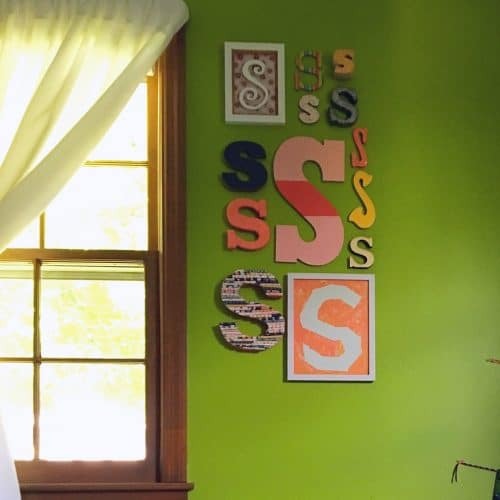 I even kept the “I” and “S” from their nursery and added them to the collages. Beds. 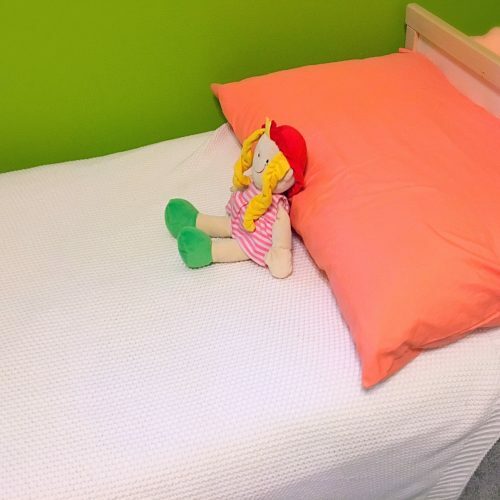 Instead of going the traditional twin bed route, I used the Ikea kids beds. They are perfect! They are a bit smaller, so they take up a lot less room and they are big enough that they have room to grow into them. Since I used the smaller beds, I couldn’t go the standard bedding route. Instead, I purchased a couple of throw blankets. The kids love them because they are not too hot, yet keep them warm against the chill of an AC. I was able to find pillowcases in the colors that I need at Target. I knew that I wanted the beds to go into the corner of the room. 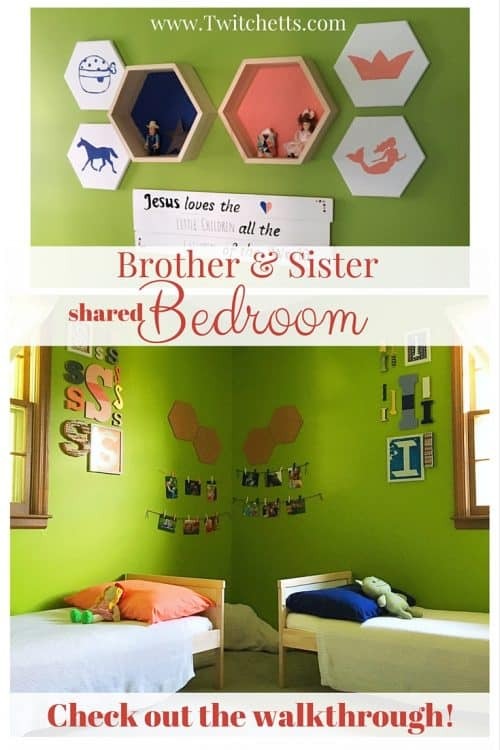 When I searched Pinterest for a brother and sister shared bedroom, it was the one idea that stood out the most. But I hated the idea of losing all that valuable real estate. After reading about calm down corners from Views From A Step Stool, I knew that I wanted to make a similar space for Little Miss. We call it her quiet corner. Quiet Corner Decorations. Hanging over the quiet corner are some pictures. The kids love looking at pictures of our family. 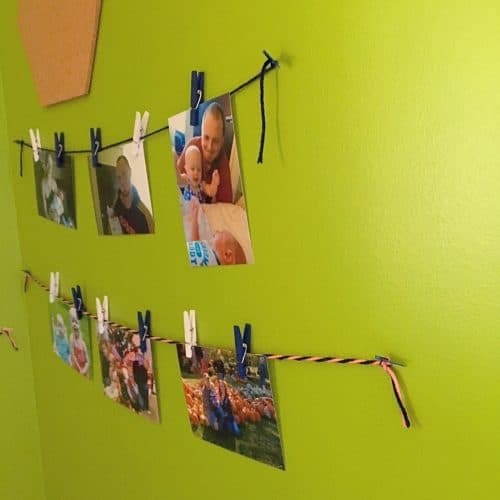 I just strung some yarn and used clothes pins to attach the pictures. 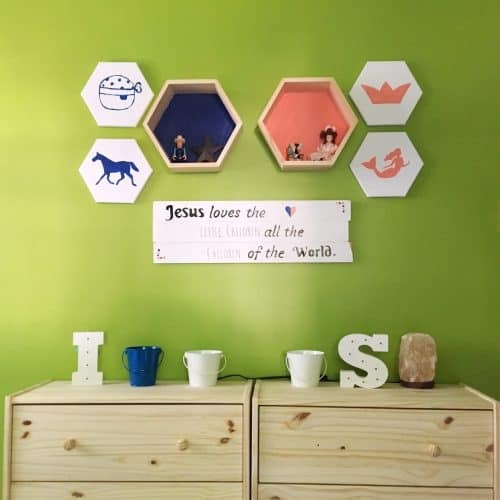 Above the pictures are some more hexagons. These cork boards will be for their special art projects. A fun way to display their hard work. I wasn’t a fan of the sticky strips that came with these, but I just used some 3m strips and that worked perfectly! Clothes Hamper and Mirror. For their dirty clothes, I hung a pillowcase inside of an embroidery hoop. 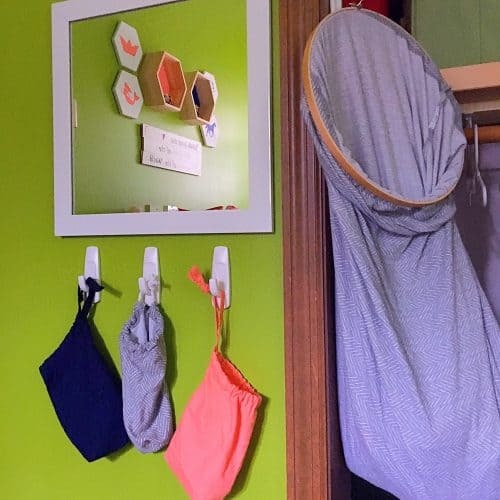 I love this method because I can quickly grab their laundry and put everything into the washer at once. Plus, it’s super inexpensive. Next to it, is a simple white mirror. Beneath that, I hung the bags that the pillowcases came in. The kiddos use the bags to put treasures into. Plus, since they came with the pillowcases, they match the room perfectly. The kids love their new brother and sister shared bedroom. I have a couple of ideas for some additions, but you know I’ll share them when they’re done. 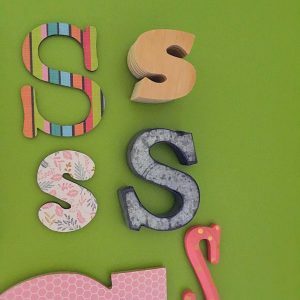 I love how easy it will be to swap out photos and art projects!